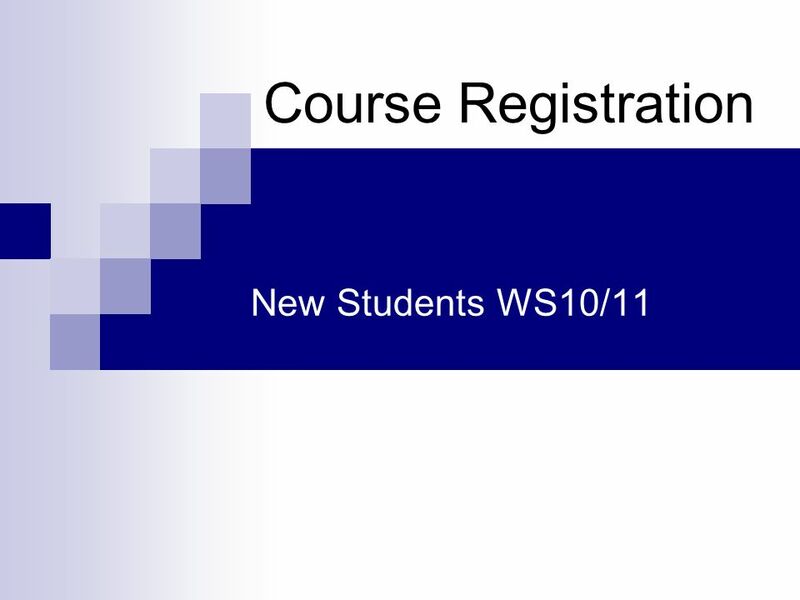 Course Registration New Students WS10/11. 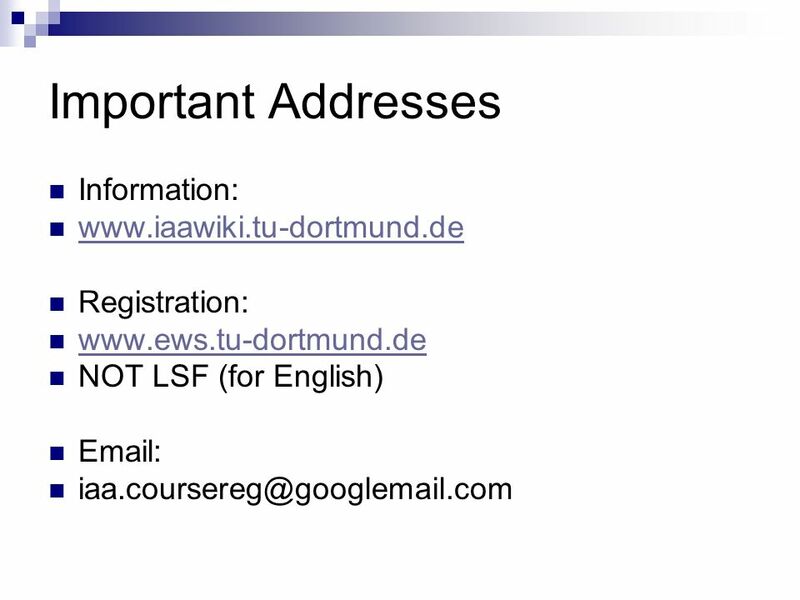 Important Addresses Information: www.iaawiki.tu-dortmund.de Registration: www.ews.tu-dortmund.de NOT LSF (for. 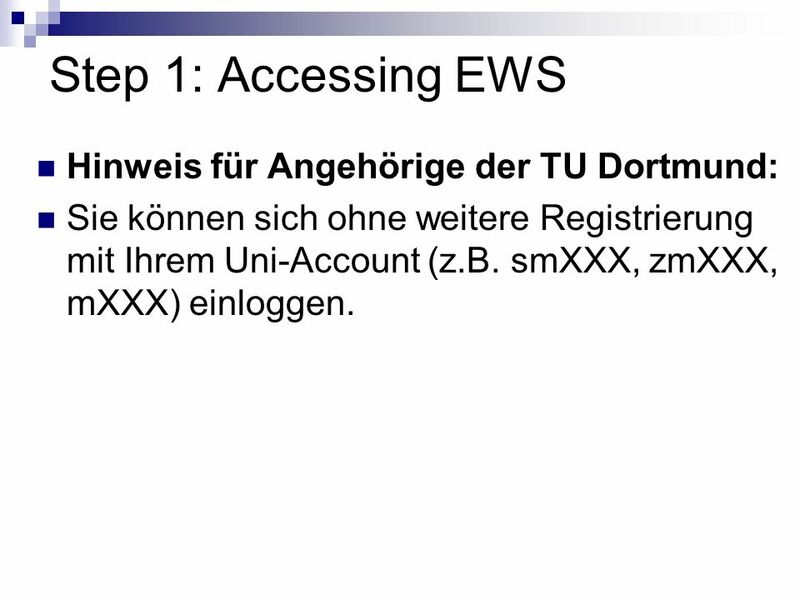 3 Step 1: Accessing EWS Hinweis für Angehörige der TU Dortmund: Sie können sich ohne weitere Registrierung mit Ihrem Uni-Account (z.B. smXXX, zmXXX, mXXX) einloggen. 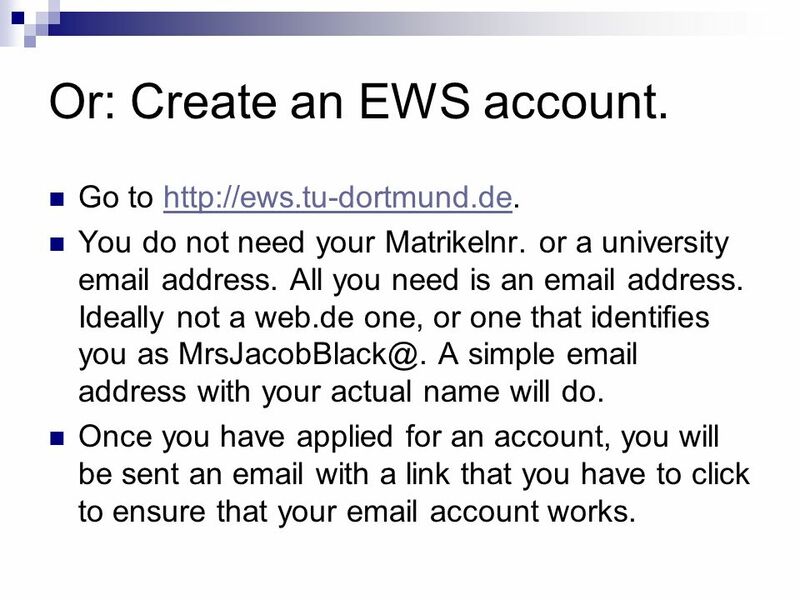 4 Or: Create an EWS account. Go to http://ews.tu-dortmund.de.http://ews.tu-dortmund.de You do not need your Matrikelnr. or a university email address. All you need is an email address. 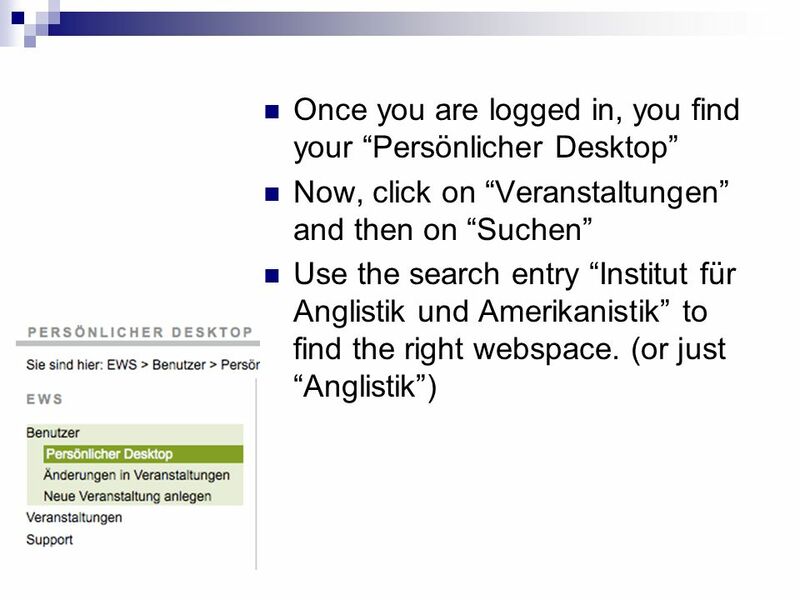 Ideally not a web.de one, or one that identifies you as MrsJacobBlack@. A simple email address with your actual name will do. Once you have applied for an account, you will be sent an email with a link that you have to click to ensure that your email account works. 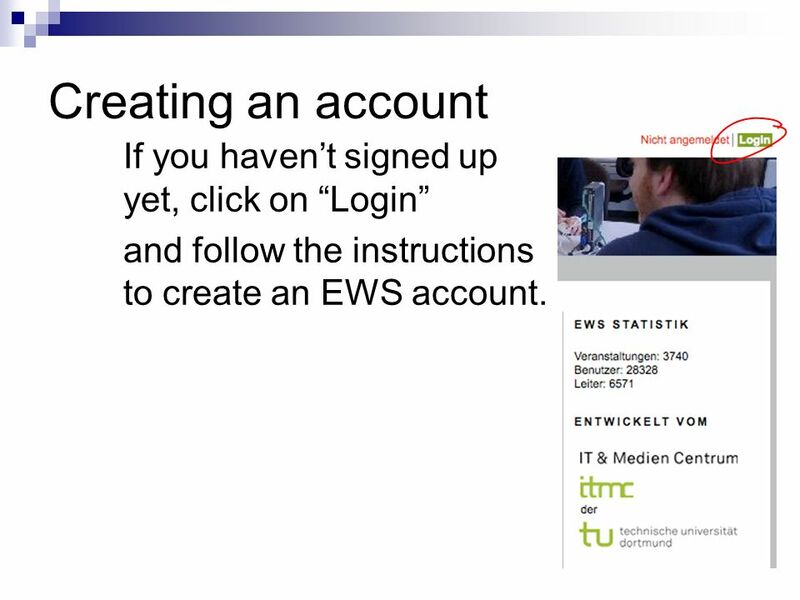 5 Creating an account If you havent signed up yet, click on Login and follow the instructions to create an EWS account. 7 This one is the RIGHT one: Click on Anmelden and confirm that you really want to register. 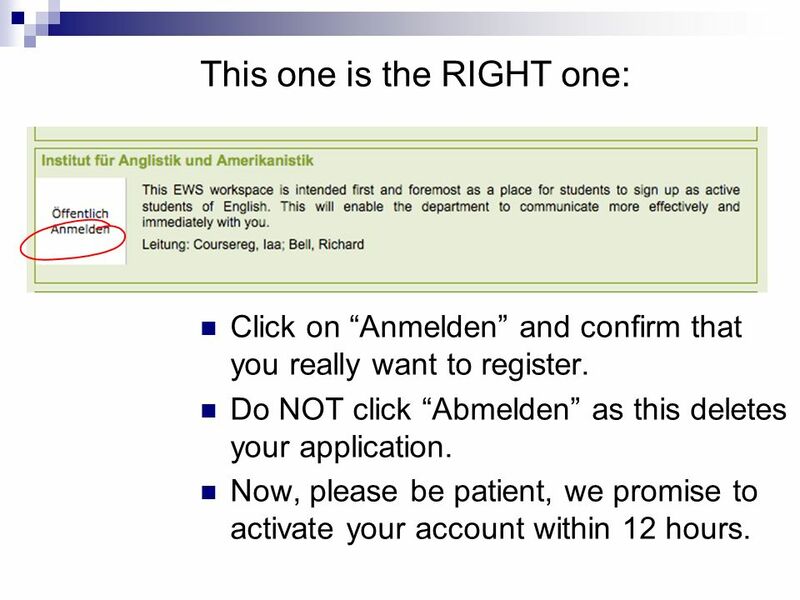 Do NOT click Abmelden as this deletes your application. Now, please be patient, we promise to activate your account within 12 hours. 8 Nearly Done Once you have been granted access to the IAA EWS space, then you can log in using your EWS account and access the internal area. 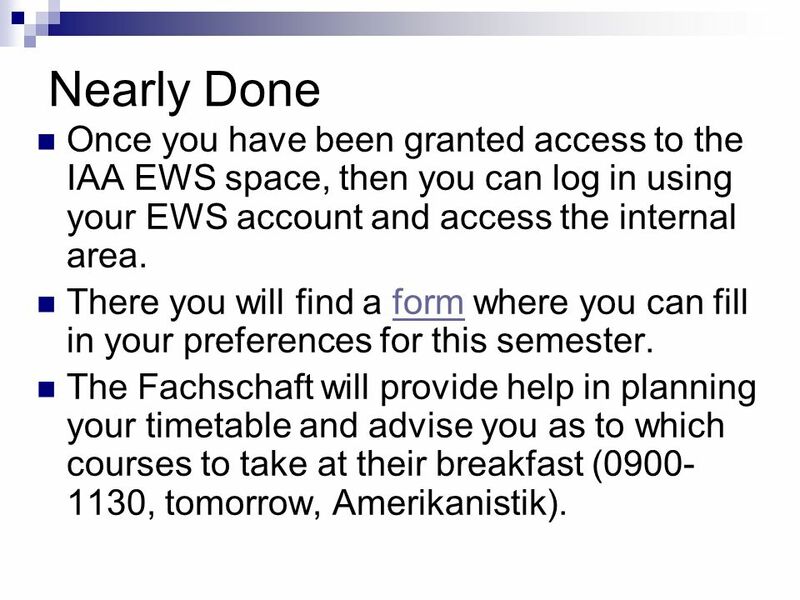 There you will find a form where you can fill in your preferences for this semester.form The Fachschaft will provide help in planning your timetable and advise you as to which courses to take at their breakfast (0900- 1130, tomorrow, Amerikanistik). 9 Deadline You have until 23:59 on Wednesday, 06.10.09 to fill in the form. When you fill in the form has no effect on your chance of getting into courses. The form will go online on Tuesday, 05.10.09 at 09:00. 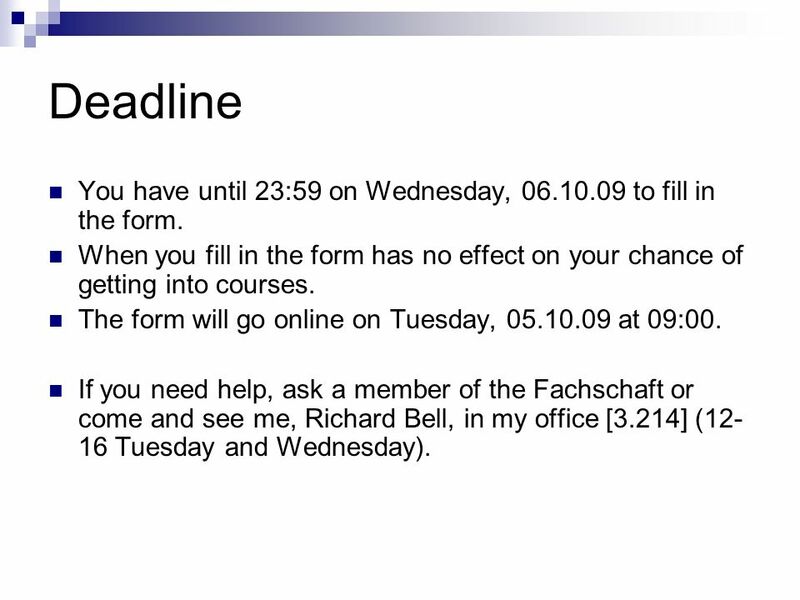 If you need help, ask a member of the Fachschaft or come and see me, Richard Bell, in my office [3.214] (12- 16 Tuesday and Wednesday). 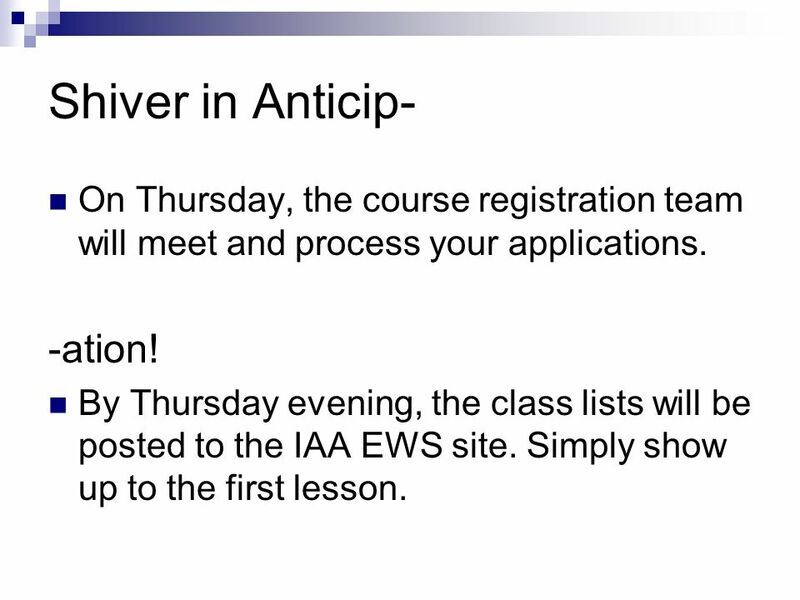 10 Shiver in Anticip- On Thursday, the course registration team will meet and process your applications. -ation! By Thursday evening, the class lists will be posted to the IAA EWS site. Simply show up to the first lesson. Download ppt "Course Registration New Students WS10/11. 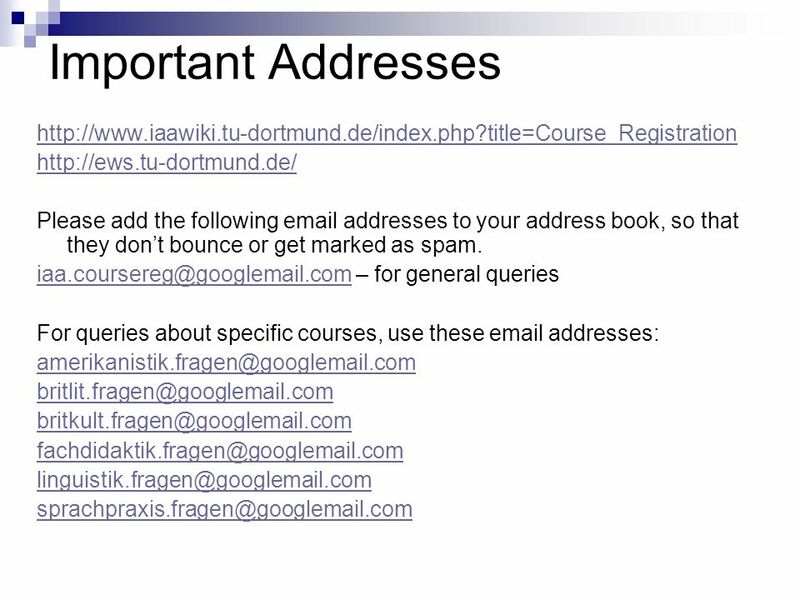 Important Addresses Information: www.iaawiki.tu-dortmund.de Registration: www.ews.tu-dortmund.de NOT LSF (for." Step 1 Start your web browser (Internet Explorer or Firefox). Step 2 Type: in the Address box Step 3 Press Enter on the keyboard. 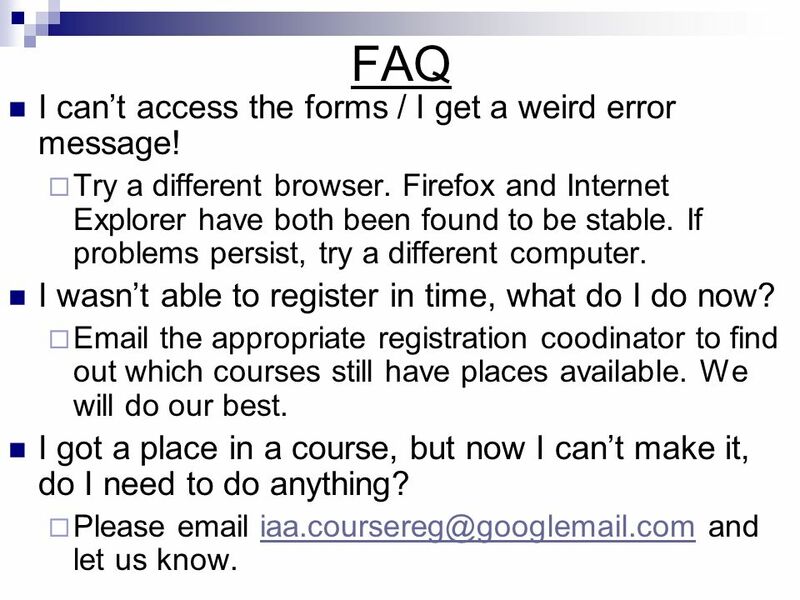 Use these instructions to help you sign up for tutorials if your course is using S-Cubed for tutorial registration. 1 SLIDE Insurance Company Regulation Division Insurance Market Regulation Division Medical Professional Liability Insurance Claim Reports Online Claim. I am the Naviance Navigator and I will be your host! Using Family Connection Online Resource for Planning & Advising. Knowledge is Empowerment Guide no. 5 Searching MEDLINE Full Text: by Subject, & by Publications. Register in My Ebsco Host & Create Alerts. FOR STUDENTS Office of the Registrar Waitlisting Tutorial. Copyright © DigitalSports. All Rights Reserved. How To Sign-Up/Update Alerts on Your School’s DigitalSports Site. 1 I am the Naviance Navigator and I will be your host! Parents Guide to Online Admissions We suggest you read this guide before you apply for your child’s school place or have it open in a separate window to.